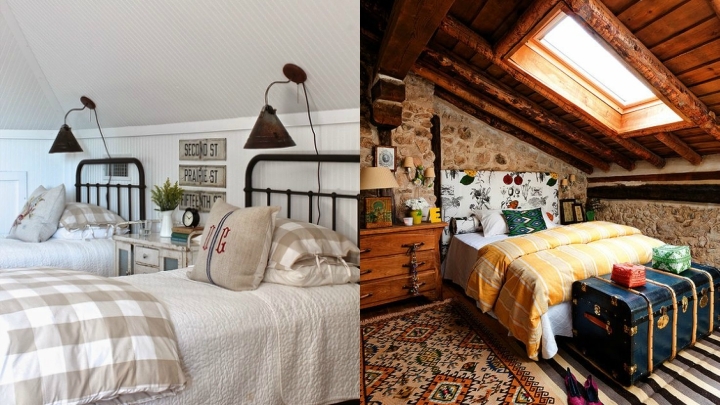 Can you imagine waking up in a bedroom in which, on the other side of the window, a nice, fresh and welcoming field would give you good morning?This may not be possible if you live in the city, but with theideasthat we present you today you can recreate a greatbedroom with country styleso that it seems that you are sleeping away from the hustle and closer to nature.It will be enough to introduce in that room certain decorative elements that turn into a nice country house your home in the city. Textiles play a very important role in this country decoration for your bedroom.You have many options, and with all of them you will be able to design a cozy atmosphere.For example, you can bet onwhite beddingwith details in some pastel color and also by floral prints.The white curtains will contribute to preserve the luminosity without the incidence of the solar rays being too direct. 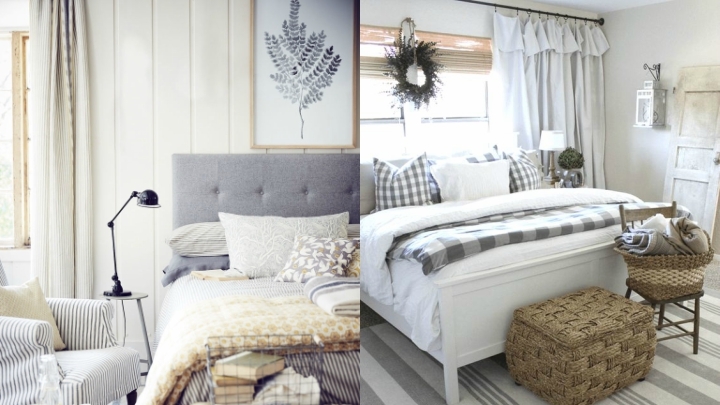 For this bedroom to be very cozy I invite you to fill the bed with cushions.Combine the prints with those of the quilt and bet for pastel tones to make it more luminous.Thetinyflowerslook great but they can also be smooth or with some other reason like stripes or pictures, for example. In your country bedroom you can not miss wooden furniture.It is themost welcomingmaterial that exists.You can use it in cupboards and in chests of drawers, for example, and they will be very nice if the pints of some pastel tonality or give them a pickled effect.You can also add some details in wrought iron orforge furniture.For example, a wrought iron bed with a wooden chest of drawers will make the dcor take on a more special style.Always successful combination. When introducing decorative details in this room you have many possibilities.Theflowerswill look great, as it is the most rural complement you can use.Put a bouquet ofdried flowers or lavender, for example, in a ceramic or glass vase.With a little bit you’ll be able to get an incredible effect.You can also introduce some corner with some old books or even a watering can. 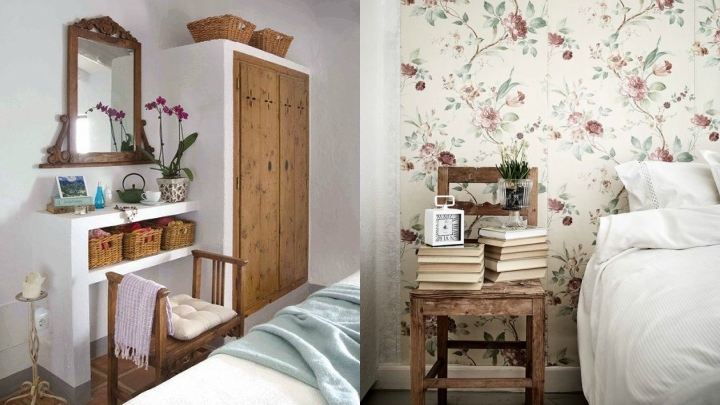 Another way to recreate the ambiance of country house bedrooms is to put awallpaper with a flower patternon the wall.My recommendation is that you do it in one of them, not at all, so that it does not over saturate the space.You can bet on big or small flowers.If you have used clear textiles you can choose aprintwith more vivid colors for that contrast, for example.Although if you want to continue using pastel tones the result will be equally amazing, very bright and cozy. A decorative element that will sit phenomenally in your country bedroom withwicker baskets.You can include a large one, for example, at the foot of the bed, or also several smaller ones on some shelves or even inside the closet to keep it tidy.It is a material that combines great with wood.